Welcome to the sixth post in the series of blogs on learning objectives. In my previous blogs, Learning Objectives – What They Are and Why You Need Them and The Science of Learning Objectives – 1, 2, 3 , and 4, we have seen what learning objectives are and why they are important. We have also looked at the six levels of the Cognitive domain of Bloom’ Taxonomy, which is concerned with mental skills (knowledge). We have also examined the Affective domain of the Taxonomy which deals with behaviors (attitudes). Today, we will look at the Psychomotor domain which is concerned with the manual or physical aspect of learning (skills). Before we proceed further, it is important to mention that though the Psychomotor domain is considered a part of Bloom’s Taxonomy, little work was done in this area by Bloom and his associates. The team cited their lack of experience in teaching manual work as the reason for their inability to contribute to the domain. However, at least three models of the Psychomotor domain were developed by scholars. They are the Simpson’s model, Dave’s model, and Harrow’s model. For the purpose of this blog, we shall go through the Simpson’s model in detail and briefly examine the other two models. According to this model, acquisition of skills occurs at seven levels. The learner would be able to adjust the pressure of the boiler by looking at the barometer. The learner would be able to set the volume of the loudspeaker by hearing the sounds. The commonly-used verbs at this level are as follows. The learner would be able to act on a series of steps to create a purchase order using SAP. The learner would be able to begin the process of weaving the cloth on handloom. The learner would be able to follow the procedure to solve the integral calculus problem. The learner would be able to respond to the instructions of the trainer. Here are some verbs used commonly at this level. The learner would be able to fix a faulty pressure valve in a boiler. The learner would be able to measure the weight of the emitted particle using a filter weighing solution. Examples of verbs at this level are as follows. The learner would be able to measure the weight of bacteria more accurately. The learner would be able to fix the problem quicker. Note: The verbs used at this level are the same as the previous level, but will be accompanied by adjectives or adverbs to indicate the learner’s expertise in performing the psychomotor activity. The learner would be able to re-arrange steps in the process to repair the washing machine quicker. The learner would be able to modify the procedure to paint walls to improve efficiency. The learner would be able to design a new procedure to repair the turbine. The learner would be able to develop a new flying maneuver. Here are some of the commonly used verbs at this level. Let us now look at how learning objectives can be formed for automobile service technician training, for each level of the Psychomotor domain. Perception The learner would be able to identify how a car is being assembled by watching a video of the assembly process. Set The learner would be able to explain the process of assembling a car. Guided Response The learner would be able to follow the steps to assemble a car under the guidance of a trainer. Mechanism The learner would be able to assemble the car. Complex Overt Response The learner would be able to assemble the car quicker. Adaptation The learner would be able to rearrange the steps in the assembling procedure to improve efficiency. Origination The learner would be able to design a new procedure to assemble the car. We will now look briefly at Dave’s and Harrow’s models of the Psychomotor domain. This model consists of five levels. Imitation – The learner observes a psychomotor activity and tries to perform the activity based on the observation. Manipulation – The learner is able to perform some actions based on memory or by following instructions. Precision – The learner would be able to perform the activity with a high degree of proficiency. Articulation – The learner would be able to coordinate and adapt a series of actions to achieve harmony and internal consistency. Naturalization – The learner would be able to master the activity without having to think much about it. Reflex movements – The learner would be able to provide instantaneous responses. This level is characterized by involuntary reactions which are not learned. Fundamental movements – The learner would be able to perform simple motor activities using basic movements such as walking, grasping, etc. Perceptual abilities – The learner would be able to respond to visual, auditory, and kinesthetic stimuli. Physical abilities – The learner would be able to develop physical strength and agility. Skilled movements – The learner would be able to perform complex movements such as those performed by choreographers and fencers. Non-discursive communication – The learner would be able to effectively use body language such as gestures and facial expressions to convey the intended message. 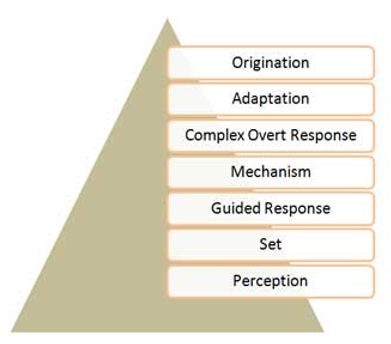 Simpson’s model is more applicable to corporate training, while the latter two models can be used in the context of performing arts and sports. The Psychomotor model deals with motor-skills. Three psychomotor models, proposed by Simpson, Dave, and Harrow have gained widespread acceptance. In my next post, we will see how to frame learning objectives. So, stay tuned.